Every now and then I create a bit of nail art where I even blow myself away with how well it turned out. I know I sound like I've got a big head right now, but can I just say, damn I did a good job of this and it turned out so much better than I thought it would. 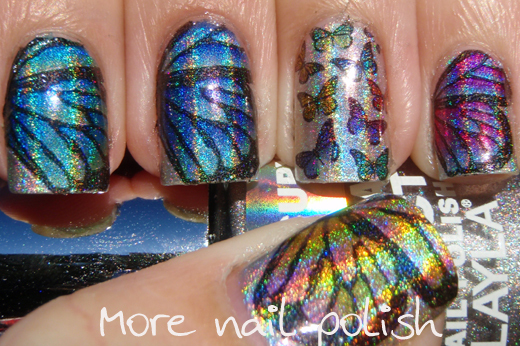 So these are my pretty multi-coloured butterfly nails. The thumb is a wing that is pink and yellow, the index finger is turquoise and green, the middle finger is light and dark blue, the pinky is magenta and purple, and the ring finger is a combo of all the little butterflies. These aren't water decals, these are something different, but totally perfect for images over the whole nail. These are completely made at home, which means you can make any colour combination that you can imagine, and not just butterflies. I think what makes these look so pretty is that they are layered over Layla Mercury Twilight - an awesome silver linear holographic polish. So I'm guessing you all want a tutorial on how to do these nails? Well you see I didn't expect them to turn out so well, so I didn't take any progress photos or anything. So how about this weekend I put together a tutorial about what product I used, where you can get it and how to do it? Or am I being too full of myself and it's really not that great and your not interested? Let me know. We luv how u are full of yourself! That's a beautiful job you've done there! Those butterflies are exquisite! We're looking for nail trends that people could ask for in the salon - and your blog is mega inspirational. Congratulations on it - it's truly art from where we're standing. I don't think you are being full of yourself enough! 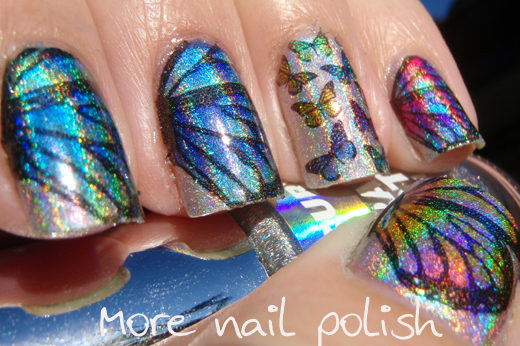 You just created multichromatic and holographic butterfly wings. 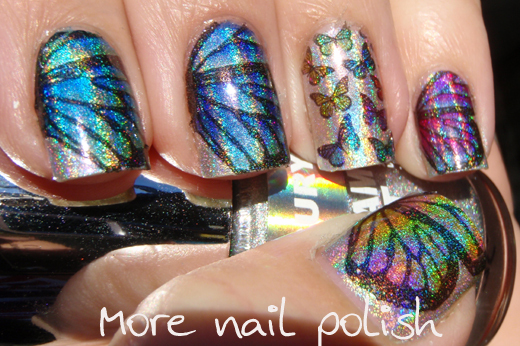 If I were you I'd be dubbing myself Queen of Holographic Butterflies. Tutorial asap and feel free to gloat a little more! These are amazing! Tutorial please, please, please!! WOW! That is so pretty, I can't stop looking at it. Wish I could do Nailart like that. Stunning! This is unbelieveablely pretty, girly & fun and funky all at the same time. I love this! This is SOOOO amazing!!! You are totally not full of yourself for nothing!! You have all right to be extra proud!!! WOAH if I could do that I would be posting it on the front page of the national newspaper!!! And yes, please please please try to compile some tutorial??? please????? *doggie eyes* please please????? WOW this is amazing. I would love to see how you do it! wow! please do provide a tutorial. i cant imagine how you did these! Tutorial please, I LOVE butterflies! Wooooowwww! That is so gorgeous - I can't wait to see your tute! WOW!! this is so beautiful!! i love this! I vote for a tutorial. They look fantastic! O. M. G. I need to know how to do these! They are just all round awesome and amazing. WOW...I hate butterflies...but WOW I just changed my mind. Yes yes yes. These would look perfect for my sisters garden bridal shower. SO yes please. I'd be thrilled with a written set of instructions and supplies! I want these nails bad enough to trial & error until I get them. LOL! This is just stunning! TY in advance for any info you share! Yes please, make the tutorial for yesterday, I'm dying for it, you didn't make a good job you made a perfect job. Can't wait for a tutorial! NEED. THE. TUTORIAL. NOW. !!!!!!! OMG. This is THE most stunning manicure i have ever seen. PLease do a tutorial on this! Thanks. i need this tutorial! Pleaseeeeeeeeeeeeeeeeeeee! Por favorrrrrrrrrrrrrrrrrrr! Gorgeous! You should feel very satisfied with the results. So pretty....I don't know if I could recreate such beauty but please post a tutorial! These are amazing!! I am definitely dying to know how you did those butterflies!!! WWWWWWOOOOOOOOWWWWWW (cartoon eyes bugging out) yes please tutorial. beautiful and you are not being too full of yourself. girlfriend, you're nuts if you think we'd say this isn't that great. this is SUPER FANTASTICALLY AWESOME!!!! you have to post the tutorial! These are so beautiful! 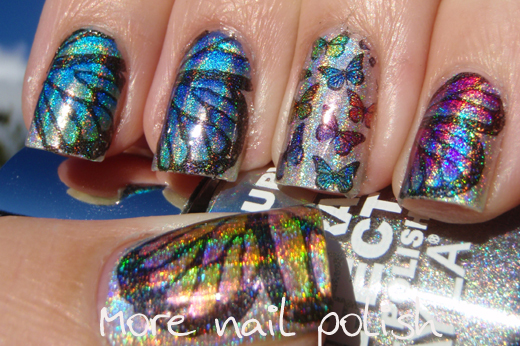 Butter flies and holographic are two of my favorite things. I would love to see a tutorial on how these are done. I can't wait to see how!!!! Brag all you want!! I am in awe - those are fantastic!!! Yes, please to the tutorial! Thank you for your blog - I sure do enjoy it! Whoa! That is sparkly and crazy awesome! Cathy, seriously Amazing, AMAZING! My flabber is ghasted!! Incredible - would love to see how it's done but I know I could never recreate this myself!!! Yes please for the tutorial! YESSSSSSSSSSSSSSSSS. 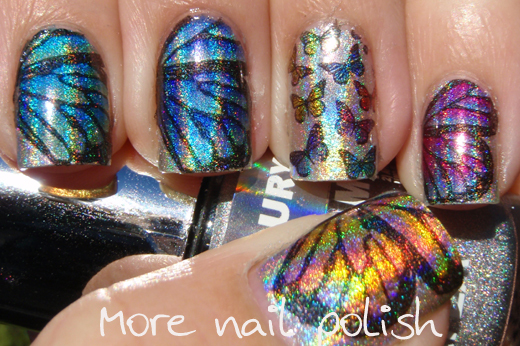 i was surfing around rather sleepily, and my eyes WIDENED O__O when i saw your butterfly mani! Wow, this is awesomesauce! You rock, can't wait to see how you did these. So lovely I loveeee the thumb so much!!! how do you take such good photos of holographics??! what settings/lighting do you use! These look so amazing! I'm sitting tight for the tut - does it involve vodka? I'm there either way. Beautiful! Are they not just the SH appliques cut. I know the small butterfly one is as I recognize the pattern from the SH selection. Then you put one of those wonderful white to clear holos from Brazil over them? I think we all need the tutorial! Duuuuuuude....that freakin' ROCKS! PLEASE do a tutorial?!?! Wow this is these nails are amazing. SO SO pretty ! I just google image searched for butterflies, but email me if you want me to send you my image files. The link you have in the tutorial video isn't working. 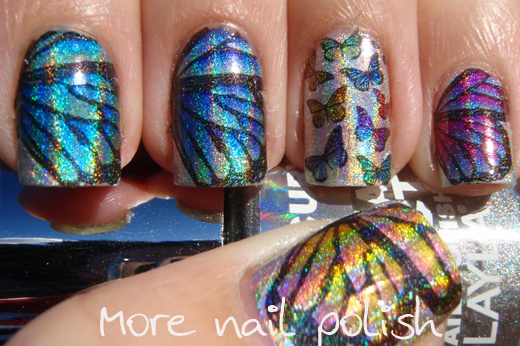 Can you send me a link to the seller and her video, so that I may purchase these gorgeous butterflies?